For months, Sweetwater Union High School District officials have insisted no one knew anything was wrong with the budget until $30 million in overspending came suddenly to light last September. But it’s now clear that multiple workers raised alarms months earlier. Last spring, a finance worker noticed strange entries in Sweetwater Union High School District’s budget, according to interviews with state officials and documents obtained by Voice of San Diego. First, the worker went to the district’s then-director of finance, Doug Martens, to raise an alarm. Martens himself created many of the entries, and said not to worry. But the worker could see that the entries were putting Sweetwater at risk of overspending by tens of millions of dollars. So, the worker went to chief financial officer Karen Michel. Michel also said not to worry. But just to be safe, Michel also circled back with Martens, she told the worker, and made sure he was documenting his reasons for making the entries, according to interviews conducted by the state’s Fiscal Crisis and Management Assistance Team and described to Voice of San Diego by investigators. Any competent budget worker would have immediately recognized the entries as suspicious, investigators with the fiscal crisis team said. And more than one worker did raise concerns about obvious budget problems, they said. Officials requested Voice of San Diego not name the workers because of a standing confidentiality agreement between the state agency and some district employees. Sweetwater is in the middle of an unprecedented budget crisis that will jeopardize the quality of education in the district for years to come. For months, officials have insisted no one knew anything was wrong with last year’s budget until $30 million in overspending came suddenly to light last September. It is now clear, however, that multiple workers raised alarms to more than one top official in Sweetwater’s administration months earlier. Exactly who else in the administration, besides Martens and Michel, knew the budget was seriously flawed is unclear. Martens and Michel – who never returned numerous calls to numbers listed in their names – both retired from the district over the summer. Sweetwater spokesman Manny Rubio previously said both retirements were pre-planned, and had nothing to do with Sweetwater’s financial crisis, but a former employee told me that wasn’t the case with Michel. Asked for clarification, Rubio said it was more than just a few weeks, but did not provide a specific timeframe. I asked Rubio on Jan. 28 whether he knew that an employee had raised concerns about the budget to top administration officials months earlier than was previously known. When asked again days later, it actually turned out the administration had been aware of what happened since October. The state’s fiscal crisis agency and the federal government’s financial watchdog, the U.S. Securities and Exchange Commission, are both looking into Sweetwater’s past financial dealings. Some Sweetwater employees noticed Martens, the director of finance, making cryptic statements last year, said Martinez, the auditor, who worked closely with Martens and Michel. Martens made off-hand comments to her and others, she said, that she didn’t quite understand. “We obviously know what he meant now,” she said. Martinez also said that Michel and Martens were warned of the overspending. “I know someone who went to them and told them a lot of things looked off about the budget,” she said. Martinez asked that Voice not reveal the person’s name for fear they might be retaliated against. Sweetwater had increased its costs significantly in recent years. The district significantly increased the size of its central office staff. And in spring 2017, board trustees approved across-the-board 3.75 percent raises, which a recent audit called “unsustainable.” Those raises hit the books last year – the same year the district overspent by $30 million. The manual budget entries, known as negative entries, were making it look as if those increased costs didn’t exist. A negative entry subtracts from a district’s budget, giving the impression that it will spend less money than it had originally planned. In Sweetwater’s case, the entries totaled more than $60 million, according to a report by the fiscal crisis agency. Martens, it turned out, never kept any supporting documentation to explain the negative entries into the budget, said Debi Deal, a former investigator with the state’s fiscal crisis agency, who retired in December. Deal completed a risk analysis on the district’s books before she retired, which found Sweetwater to be at “high risk” of insolvency. “We asked for supporting documentation for those entries, and we basically got nothing back,” she said. Some negative entries were made by employees working beneath Martens, according to documents obtained by Voice, but many were made at his direction, Deal said. Deal also discovered that Martens, who was tasked with uploading payroll expenses into the budget, withheld those expenses from the district’s books for several months in 2018. When seen in combination with the negative budget entries, the action did not seem like a mistake, but another tactic to make the district look like it wasn’t overspending, Deal said. Deal’s report concluded that Sweetwater has been beleaguered by poor management and bad financial practices for years. Administration and union officials, who recently showed up at a County Board of Education meeting to defend Sweetwater’s current administration, have seized on that part of the report in an attempt to deflect blame from current district leaders. 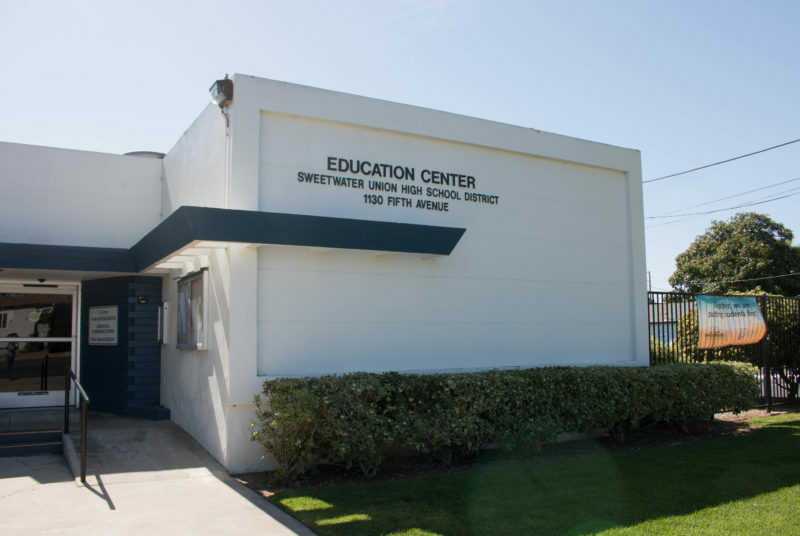 “This is a situation that the current school board and superintendent inherited from the previous administrations that made such questionable decisions,” wrote Gene Chavira, president of the Sweetwater teachers’ union, in a letter to members in December. Chavira wrote the letter after some rank-and-file members of the union called for a vote of no-confidence in the current superintendent and Board of Education. The fiscal crisis agency’s report was very clear: Mismanagement in the district may go back many years, but specific instances of potential fraud, like the negative budget entries and the withheld payroll expenses, all occurred last year, under the current administration. Sweetwater’s five current board members were elected on a transparency and anti-corruption platform in 2014, after a bribery scandal in the district that involved pay-to-play construction contracts. Four previous board members were convicted of crimes, and the previous superintendent, Jesus Gandara, served jail time. Janney, the current superintendent, was hired in 2015. The district is relying heavily on cash borrowing from several of its community building funds, which are supposed to be earmarked for construction, just to stay afloat. Without the ability to borrow, the district would likely need to get an emergency state loan – which triggers the automatic firing of the superintendent and unseating of board trustees. Fine, the head of the state’s fiscal agency, worries Sweetwater officials don’t comprehend the true gravity of their current situation.